Spring Rolls originated from Asia but Nigerians have recently been bitten by the Spring Rolls bug! I love Spring Rolls because once you get the Spring Rolls Wrappers right, you can fill them up with anything and they will taste great. They are usually filled with vegetables (hence spring) but I love to add beef to my spring rolls filling. You can use store-bought wrappers for your spring rolls or you can make them yourself. 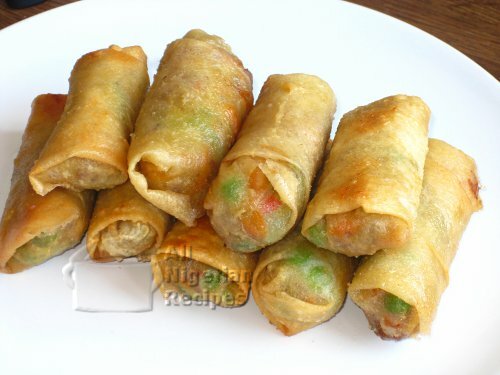 To see how to make them at home, see: Homemade Spring Rolls Wrappers. You can use any combinations of beef and/or vegetables for your spring rolls filling. See the video below for details of how to make Spring Rolls.